Subject: Antique print, titled: 'Les Tyrans de la voie publique. Les Balayeurs. (The tyrants from the public road. The sweepers).' - Soldiers are sprayed with waste water by an unwary street Sweeper. Condition: Good, given age. Foxing and traces from handling in the margins. General age-related toning and/or occasional minor defects from handling. Please study scan carefully. Medium: Tinted lithograph on wove (vellin) paper. Size (in cm): The overall size is ca. 21.7 x 14.4 cm. The image size is ca. 18.5 x 11 cm. Size (in inch): The overall size is ca. 8.5 x 5.7 inch. The image size is ca. 7.3 x 4.3 inch. 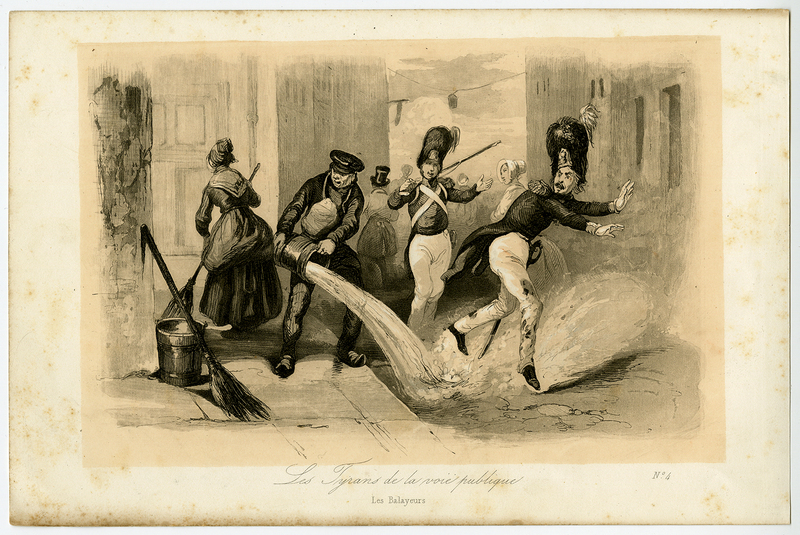 Description: This print originates from "Le Chapitre des Accidents" by Maurice Alhoy, Paris: 1845. Artists and Engravers: Made by 'Victor Jean Adam' after own design. Victor Jean Adam (1801-1866) worked in Paris as a lithographer.